In my first two posts about our Back Yard Chickens: Saving Buffy and Her Friends and Saving Buffy Pt 2 Health, I mentioned the coop we built on a few occasions. I thought it may be advantageous to talk a little about the coop and our thought processes when we built it. Our first concern, being a very frugal family, was the budget to build the coop we wanted. The wood, the shingling, the Hardware cloth, plus all the little things: nails, staples, lattice could add up to a tiny sum. Actually pricing out everything before we built was going to be about $1800 (Home Depot, Lowes, and local Hardware Store) I thought this to be a little on the ridiculous side so, as with everything, we prayed about it. God always answers our prayers-maybe not the way we want, but we always get “the right” answer. In this case the majority of our answer came from 3 sources. The first came from just cleaning out our basement and storage shed. We found many of the small items we needed along with a few pieces of lumber that would suit. We also had two small windows left from remodeling our house a few years ago. I had tried to sell these windows back when, but no one called on them and they ended up in a back corner of my shed. Secondly, our neighbor, whom I work with a lot on projects, offered several pieces of wood-mostly 2X4′s which were perfect for the uprights on the walls. Another friend had the coop door, more wood, and some plywood perfect for the inside walls of the coop and nesting boxes. Third came from scouring Craigslist. I have talked about CL before, but if you don’t utilize it, you are missing a lot of opportunity to save money-let alone helping to recycle items that may otherwise end in the landfill. We were able to get the majority of the wood, some shingles, and other items from CL-ALL for just the time and gas to go pick it up. The only expense I had to purchase was the hardware cloth to wrap the entire coop. This is not cheap when you need a larger quantity, but outlaying $200 for the hardware cloth vs having to layout the cash for everything was fine with me. We used a combination of designs that we had found on the internet that seemed to work well with what we wanted. The frame being no different than if you were building a small shed, without wall coverings on the majority of it. The coop itself should be enclosed for the hens to feel safe at night as they sleep. 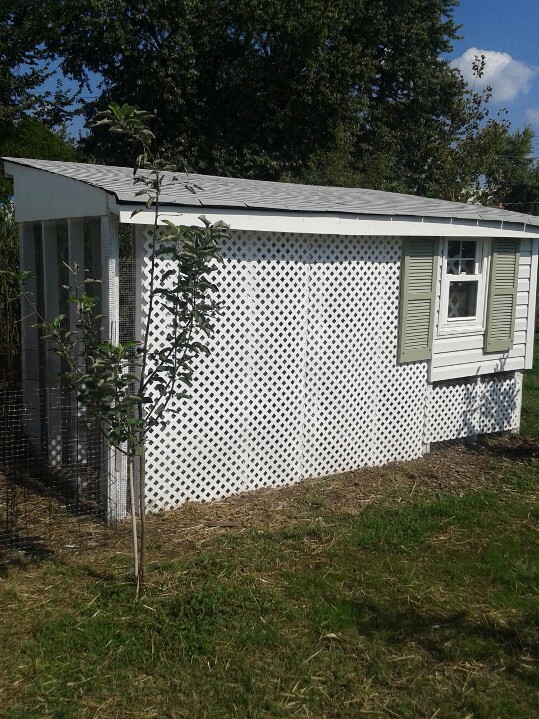 Most people that saw us building had no clue what we were building, but I believe, we did a very nice job in making sure that the coop matched the house and shed esthetically. On the back side this summer, we planted sunflowers which covered the coop completely, so even the neighbors across the street(facing our backyard) could not see much of the building. The side of the coop which faces our neighbor to the east, was grown up with pole beans. The bean plant covered the entire side of the coop, yet allowing some airflow through the window behind the plant. 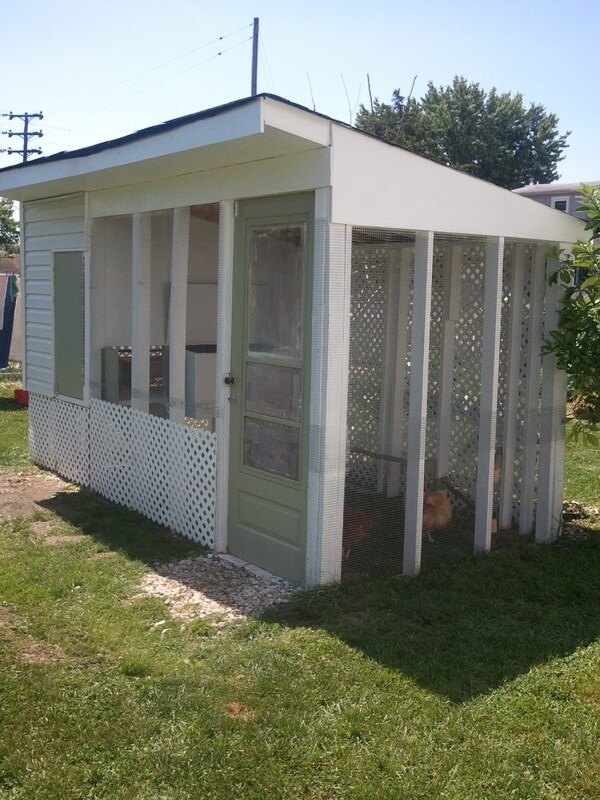 The coop itself is approximately 12′ X 6′ or 72 sq ft of space. Most BYC enthusiasts say that there should be about 10 sq ft per chicken, so this was ample for our 7 hens. The inside coop, where the hens sleep, is about 2′ off the ground and completely enclosed. The girls can feel very safe when they go to sleep at night. Concerned about rodents and foxes in our area, I enclosed the entire coop in hardware cloth. This sturdy steel mesh is impervious to rodents and other predatory animals. On the floor of the coop, I buried the hardware cloth about 6″ deep to cover the entire floor, then wrap it up the walls. This keeps any digging critters from trying to tunnel in from underground. On top of the wire mesh on the floor is about 4-6″ of sand (Free from CL). Since chickens need sand as a part of their diet this was an easy choice, as well as being very easy to rake and strain chicken droppings. Of course having a little sand in the chicken droppings, along with wood chips from the upstairs bedding, is a perfect mix for our composter. The nesting boxes and upstairs coop was built with flat surfaces all around. we used single cut plywood so we did not have to piece any surface. This makes the coop both easier to maintain and longer lasting with less wood cuts. We then painted inside with a high gloss paint which is very easy to wash down and scrub as needed. You may notice that there is very little bedding inside the coop. This bedding is really only used to keep the hen droppings from hitting and sticking to the painted floor. I can use a rake to pull the droppings and some of the wood chips through the clean-out door on the side into a tub, which is then emptied into the compost bin. The wood chips we use are from TSC(Tractor supply) at $5 per bag, and a bag will last us about 2-3 months. The two nesting boxes, see the right side of picture inside, are lined with wood chips and straw so that the girls are comfortable when they enter to lay there bounty for us. 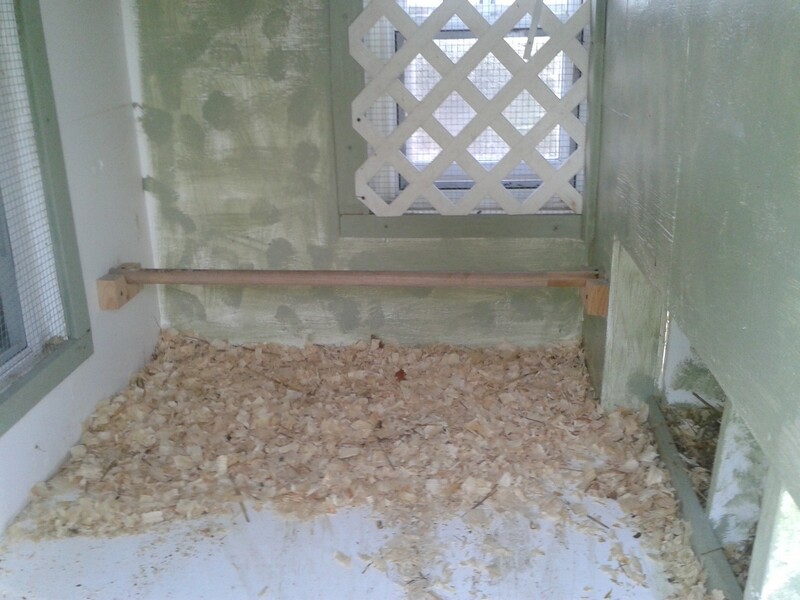 These are also easily cleaned out, but there is no need to change this bedding everyday as they never leave droppings in the nesting box. Once to twice per month, I pull everything out of the coop, replace all bedding, clean out the sand and power-wash. Some may say this is a little to often, but I am a through believer in taking a little time more often than having to spend a lot of time later. Keeping up with the maintenance and cleanliness of the coop is much easier than trying to scrub it or make repairs every few months. I am happy to share ideas or give advice on what to do, or not do when planning your backyard chicken flock. Please feel free to add any comments or questions you may have, I always respond. Please take a moment to check out the group on Facebook to help Change the Zoning Laws in Baltimore County to allow Back Yard Chickens.